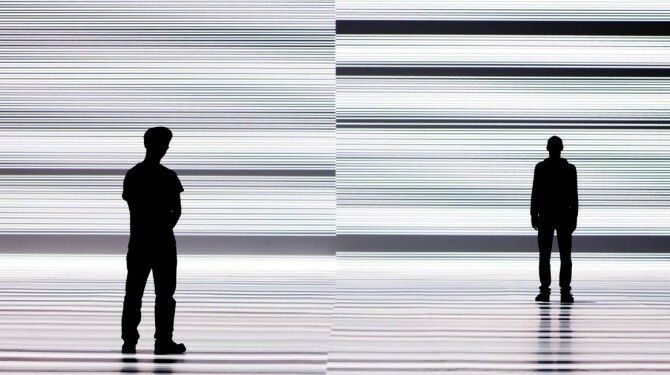 Like many of Ikeda’s electrifying works, test pattern represents the intense energies of massive digital data flows that increasingly shape our globalised world. Ikeda is one of Japan’s leading electronic composers and visual artists, and has gained a reputation internationally as one of the few artists working convincingly across visual, spatial and sonic media. He elaborately orchestrates sound, visuals, materials, physical phenomena and mathematical notions into immersive live performances and installations. test pattern is a system that converts any type of data (text, sounds, photos and movies) into barcode patterns and binary patterns of 0s and 1s. Through its application, the project aims to examine the relationship between critical points of device performance and the threshold of human perception.